April Rhodes’s Date Night Dress seems to be the thing all the cool kids are sewing these days. Luckily for me, it also seemed to be fairly easy for a beginning sewer (sewist? seamster?). And best of all: it only took me a weekend* to put together. 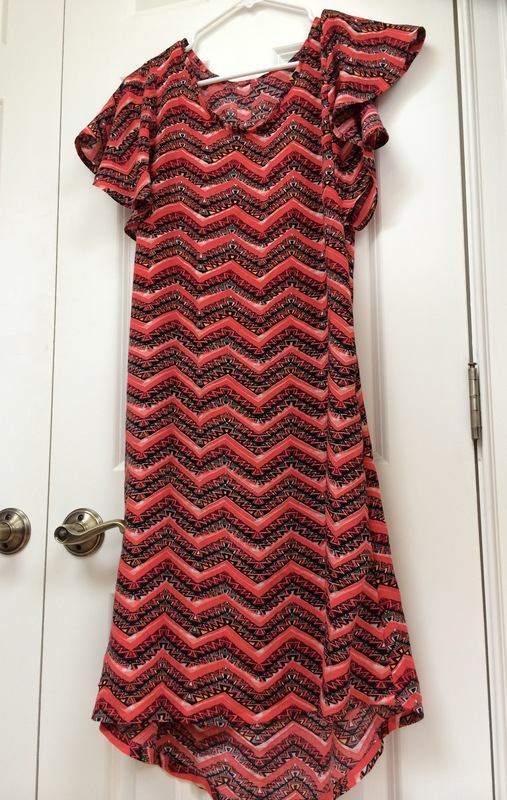 I forget how I first ran across the pattern, but it stood out because it’s so much like all of the dresses I have in my closet: fluttery sleeves, knee length, loose for comfort but belt-able for shape. I was hesitant to jump into the world of garment making (it’s worth reminding you that at this point my total sewing project tally is one bag, two potholders, and one quilt top), but the pattern looked forgiving enough—and the potential end result awesome enough and totally my style—that I decided to go for it. 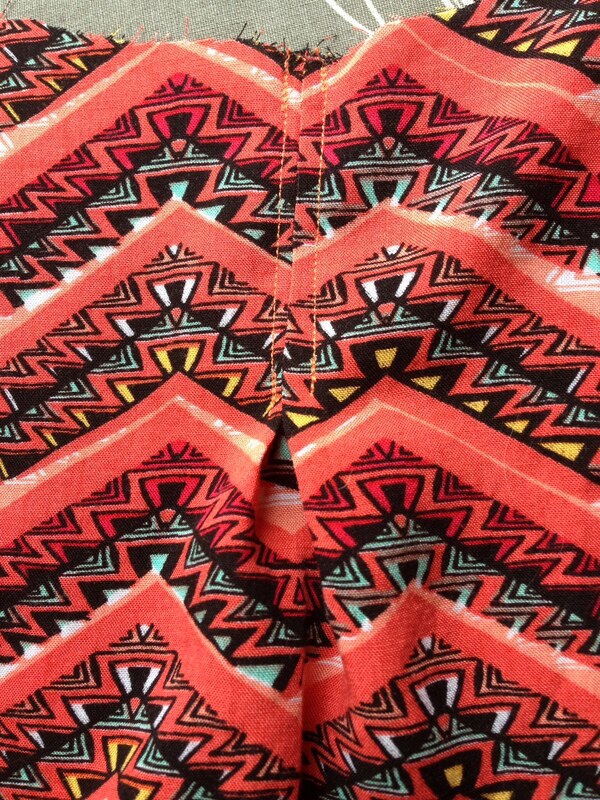 Step two: lay out the bright orange zig zag rayon challis and marvel at its bright orangeness. Step four: pin and cut. Step five: sew the most adorable box pleat in the history of the world. Fall in love with box pleats and how adorable they are. Step six: sew the rest of the dress. Really, it’s pretty much that easy. April gives amazing step-by-step photos and incredibly clear instructions. 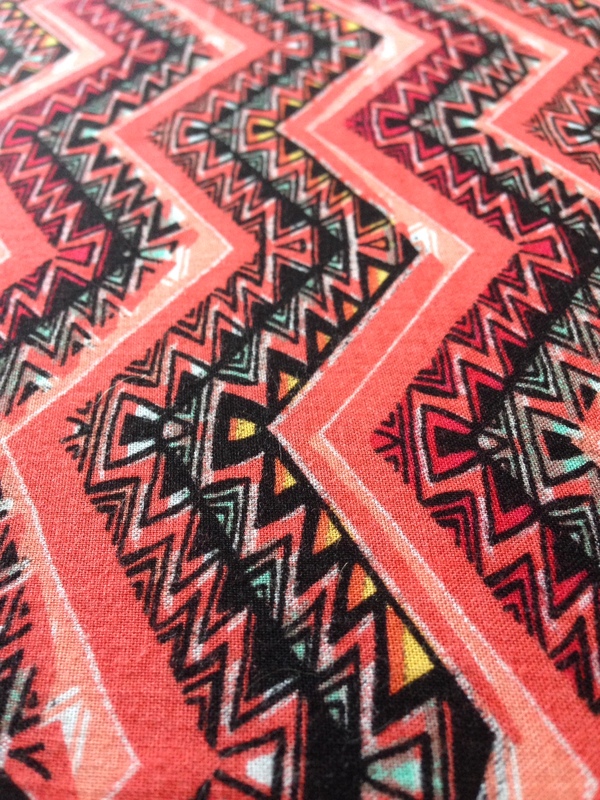 The hardest part is getting your fabric to obey (see step three). I used a ton of pins, probably a little too much steam, and cut myself a bit of a break for being a first timer. Step seven: chicken out of actually modeling the dress, and instead hang it on a hanger and admire it from afar. In case you somehow missed it, I MADE A DRESS. TO WEAR. THAT IS HANGING IN MY CLOSET WITH ALL OF MY OTHER ACTUAL CLOTHES. It was a pretty good weekend. * I’m betting that if I had chosen a less stretchy/slippery fabric, I could have finished in one day, but quadruple-checking to make sure that everything was properly aligned before I pinned it took extra time. ** Similarly shaped? As it turns out, you don’t need to worry—the dress has enough room that I could have gone with a small all the way down and been fine. *** I ordered the rayon challis along with a striped cotton shirting fabric that I suspect will be a bit easier to work with. I would have used this first, but it’s a little bit sheer, and I don’t have the right color of tank top/tights to wear under it. A good reason to make the simple slip pattern that comes with the dress pattern, I suppose…. TIME: Roughly an hour to cut and tape the pattern (probably less if a cat hadn’t been all up in my business). Another hour to pin and cut out the pieces (again, probably less if I had used a better space than my kitchen floor and if my fabric hadn’t been so awkward to work with). Two and a half hours of sewing on Saturday; two more on Sunday. Six and a half hours total, some of which was spent multitasking.